Do you love the cleaning power of vinegar, but hate the smell? Vinegar is an inexpensive, natural cleaner and deodorizer. You can use it to clean many surfaces throughout your house. The sharp odor of vinegar can be unpleasant for many people, even though it will go away as soon as it dries. That doesn't help if you are holding your nose, or even experiencing a gagging reflex from the vinegar scent. To make vinegar smell less like vinegar, you can infuse it with a scent that you actually like. This approach allows you a wide choice of scents to add, many from your own kitchen or garden. What scent do you like best? You have your choice. Think of roses, lavender, rosemary, mint, lemon peels, orange peels, lime peels, cinnamon sticks. You should avoid dark colored herbs, as these could change the color of the vinegar, and potentially stain the surfaces you are going to use it to clean. The vinegar will extract and retain the scent. However, this approach requires time to allow the vinegar to do that extraction. You also will be introducing mold spores and bacteria from the flowers, herbs or fruit, requiring a couple of steps. Vinegar should prevent these from growing if it is not diluted. Flower petals, herbs (dried or fresh), fruit peels, or spices. 1. Sterilize the two glass bottles by boiling them for a few minutes and allowing them to cool. 2. Once the bottles are clean and cooled, place your chosen herbs, fruit, spice or flowers into one of the bottles. The more you put in, the stronger the scent will be. 3. Fill the bottle with vinegar. 4. Cap the bottle and allow it to steep for 10 days. 5. Open the bottle, and strain out all of the flowers or herbs. 6. Pour the vinegar into the second bottle. Cap it and store in a cool, dark place. 7. If the vinegar becomes cloudy or has visible mold, discard it. If you need scented vinegar immediately, this is the approach to take. It is ready to use as soon as you make it. You won't have problems with pigments getting extracted into the vinegar as you are using only a few drops of essential oils. You can make this scented vinegar in the original vinegar bottle or in a spray bottle you plan to use for cleaning. 1. Add several drops of your favorite essential oil to the vinegar. 2. Cap the bottle and shake it to distribute the scent throughout the vinegar. 3. Label the bottle with the scent used and the date prepared. You don't want to mistakenly use it in a recipe! 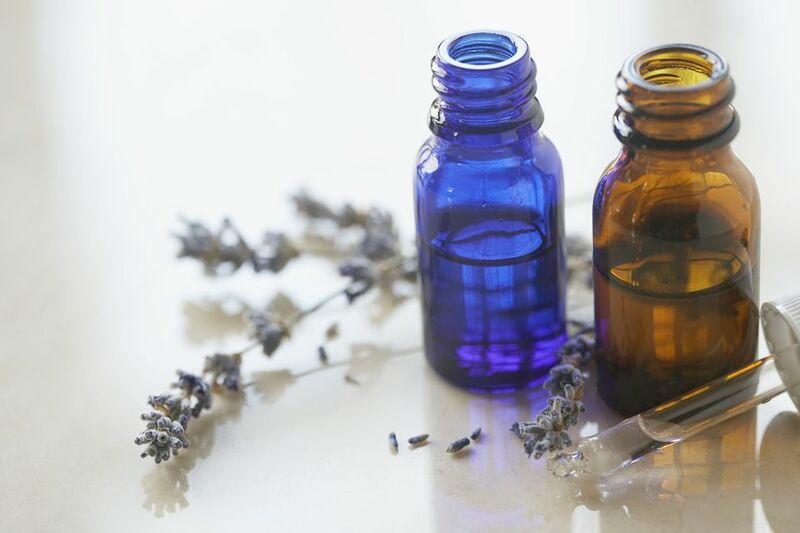 Try lavender for laundry and citrus or peppermint for around-the-house cleaning. Keep all cleaners out of the reach of children. Where Can I Buy Washing Soda? What Are Good Eco-Friendly Stainless Steel Cleaners?